I have enough projects waiting for me to work on and I am not short on amps but I really need to build a new one. I have not used the 12BK5 and I have a bunch of NOS ones collecting dust. I am hoping that I can get them to play nice with a MOSFET phase inverter, 70V line transformer, a laptop power supply and a switching high voltage module. The 12BK5 biases up at -5V in single ended duty so it does not need a lot of signal prodding it so I might get away with a single 12AX7 with a Bassman styled tone stack.Whether the negative feedback remains depends on the amount of gain and the low end through the output transformer.I have used the IRF830 for the PI so I know that part will work, will be trying the LND150 to see how it will do. It's already a nice chassis. Love that you used a SMPS. This tube is really nice, 3.5W in SE. The filament current is a bit high at 12v though. How high is your plate voltage? Can the SMPS really supply the expected 80mA? We will see what it can do. Part of the reason for this build. No NFB for now, need to update part changes but I think this will be the board. 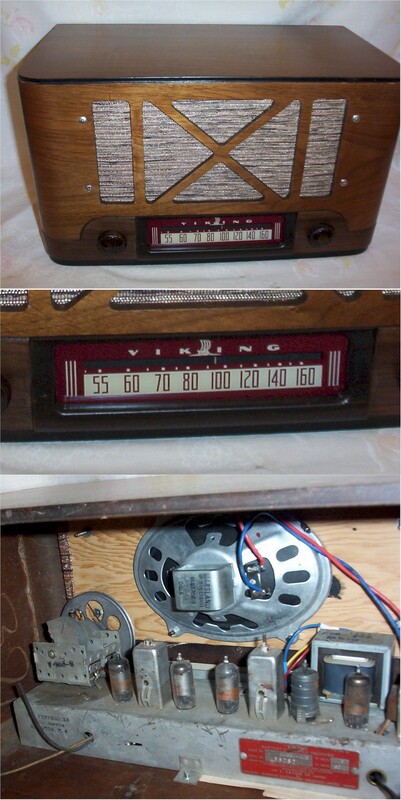 Bought a tabletop radio today for $20. It is a battery operated one, 1R5, 1T4, 1U4, 1U5 and 3V4 tubes running 8.4V heater string at 50 mA, 90V plate supply for 0.25W. The 1U4, 1U5 and 3V4 are all pentodes and look like they may be an interesting project. I thought a 5W SE transformer for this cabinet and a 6x9 speaker might be useful. Seems someone thought the same thing with the speaker and it looks like they upgraded the output transformer. Thinking about it and looking at the wires, it might be a line powered version and the tube complement would have been a more common configuration. I think I see a pattern why it takes me a while to complete projects. Last edited by Printer2; 26th January 2019 at 11:10 PM. Nothing fancy, may give it a shot of paint later. Might I ask what you used to cut it so cleanly? Cold saw? Band saw? Something else? There was a construction project right next to my work place, and when it ended, the workers thoughtfully abandoned a pile of construction rubbish right outside the side door of the room where I work. Buried in between scraps of drywall, dozens of loose nails, and chunks of thermal insulation, I found a couple of short lengths of steel C-purlin, which I rescued and saved for possible use as chassis. I grabbed some C-purlin once, have it around here somewhere. No, this is just a scrap off cut from work. We have a small metal working shop at work. So just a shear and brake for this one. There will be wood blocks in the ends to which the screws that hold the chassis in the cabinet fasten to. So it will be fairly sturdy. This galvanized sheet is a little stronger than what homes have, can't remember the gauge. I did a photo example of cutting and bending a similar chassis at one time, probably still at Photobucket but I still have issues with them so won't be visiting there soon. The thickness is still thin enough to cut with a hand sheet although it takes some effort. Can cut it with a fine blade hacksaw or a bandsaw if you have one. Scribe a line and with a file you can get an edge that would not be much worse than done with a sheer. I showed how to bend the metal using some angle iron and bar stock along with a piece of wood and a hammer. The more patience you have and going slow creates a better look than a get the job done style. The chassis pic with the sockets mounted has a piece spot welded in where I had a hole for a socket and now the output jack. I thought it was a better arrangement, I won't be having speaker magnet issues. I am thinking of wiring it up tonight or tomorrow. That or my Telecaster project. The guitar will be more useful to me, the amp is just something I wanted to do because I have not done any electronic project for years. Just a cheap and dirty project to scratch an itch.